It is a position many of us have found ourselves in before – unemployed and worrying about how exactly we’re going to be able to get by until the next pay check (whenever that might be). It is important to remind yourself that the situation is temporary, and to not be too hard on yourself in the meantime. However, of course, it is important to be frugal when you are yet to have a regular income again. Here are some tips on saving money during your job search. Tip 1: Cut unnecessary expenses. Unnecessary expenses should be the first to go while you are searching for a job. The mandatory expenses including housing, food and health, can add up and without a steady income coming in, it is safer to shift your focus to saving money. After all, your job hunt could last longer or your start date presented when you land a job could be later than expected. It is better to have a cushion instead of spending the money that you do have on clothes, personal spa days or a costly holiday. Tip 2: Find jobs online or using your mobile phone. Many jobs are posted online these days, meaning you can save on printing hundreds of CVs and cover letters that may very well never be read anyway. You can use local amenities like the library to get internet access if that is an issue, or if you have a smart phone you could use that to search for vacancies on popular job sites, meaning you can carry out your job search anywhere and everywhere and apply with the click of a button. Tip 3: Think and then think again about your accommodation. Rent payments are a good chunk of income even when you do have a job. While you are on the hunt for a job, be very aware about what you can afford for rent and make sure you ask the right questions before choosing a place to rent. Having roommates can help make rent a bit less expensive, or if you have family in the area, moving home until you land a job could be a practical decision, you will thank yourself for later. Tip 4: Become a master at food preparation. Dining out here and there adds up, no doubt. Learn how to food prep so that you can save money on groceries and use only the ingredients that you need. Then, you can take food with you on the go and avoid buying food out just because you need something quick. Remember to always have a water bottle with you, too! Tip 5: Don’t jumpstart adding to your work wardrobe. During your job-hunt, be sure to have a few different professional pieces that you can mix and match depending on the workplace environment of your potential employers. But hold off on purchasing any additional items. It is best to do so after you land the job so you understand how dressed up your colleagues get. After all, you don’t want to add to your suit or dress collection and then learn two days after your start date that everyone dresses up jeans in the office. Tip 6: Save your receipts. 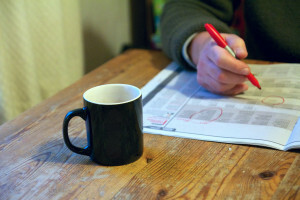 The money that you spend on your job search can be extremely helpful during tax season. Fees do add up throughout a job search, and many of them could be tax-deductible. Record your mileage for trips, too! Of course, there is financial help available in the UK for those who are searching for work. It is important to know what you are entitled to in terms of payments until you find the job that is right for you. Other than that, keep an eye on your expenses and stay focused on your job hunt. Which Money Saving Ideas Would You Draw the Line At? Coffee drinker? This Money Saving Tip Could Pay Your Energy Bills!